2:15 –3:15 Amb. Tita de Villa: Challenge 2010…..Parish Pastoral Council for Responsible Voting? 6:00 Inculturated Eucharistic Celebration by Mindanao and MOPPresider: Most Rev. Arturo M. Bastes, SVD, D.D. Please feel welcome to use any of the information in the Newsletter for your own public relations purposes – perhaps you would like to forward it to others you know who would be interested in its contents, or to the editors of like journals or news organs. You may also integrate it into your own website or in other of your publications, or you are welcome to copy it for distribution. You can find all the back issues and the future ones by clicking on the link “publications” on the CBF homepage www.c-b-f.org. 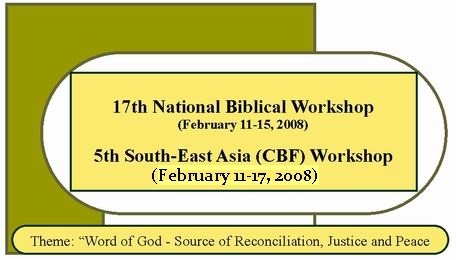 Please note: The CBF Newsletter is only issued electronically as pdf-file. You need Acrobat Reader in order to open it, and this you can download for free under http://www.adobe.com/products/acrobat/readermain.html.